The U.S. Supreme Court refused to hear an appeal of the disputed Santa Maria Groundwater Basin management plan, ending 16 years of costly litigation over water supplies in Northern Santa Barbara County and Southern San Luis Obispo County. The Santa Maria Groundwater Basin lies underneath much of the northern and southern sections of the respective counties. Well owners in Nipomo, Oceano, Arroyo Grande, Grover Beach and Pismo Beach all draw water from the basin. In 1997, the Santa Maria Valley Water Conservation District, which manages Twitchell Dam, a reservoir on the county line, filed a lawsuit over usage of water in the basin. When a groundwater user or group of users asks a court to establish water rights, the court determines how much water well owners can extract. The process of a court determining groundwater rights is called adjudication. After more than a decade of adjudication, a superior court in Santa Clara County ruled in 2008 on the allocation of water in the Santa Maria basin. As part of the judgment, the court ordered the Nipomo Community Services District to pipe 2,500 acre-feet of water per year from the city of Santa Maria to the Nipomo Mesa. The project is expected to cost around $20 million, and the Nipomo Community Services District incurred more than $3 million in adjudication expenses. The Santa Maria basin adjudication process cost all parties involved a total of more than $11 million through just the first 12 years of the court battles. Last November, a state appellate court upheld the 2008 superior court judgment. 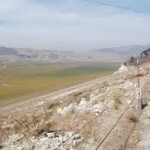 The California Supreme Court then refused to hear the case, validating the basin management plan. But, a group of farmers and landowners who extract water from the basin refused to sign the management plan, claiming the city did not have rights to groundwater. Part of the management plan stated that the city of Santa Maria had the right to pump water from the aquifer, in addition to piping in water from Twitchell Dam and the State Water Project. The landowners and farmers appealed the ruling to the U.S. Supreme Court, which last week, chose not to hear the case. Like the Santa Maria basin, the Los Osos Groundwater Basin and Paso Robles Groundwater Basin have suffered declining levels of water in recent years. The Los Osos Groundwater Basin is already in adjudication. The Los Osos Community Services District (LOCSD) filed a lawsuit in 2004, asking San Luis Obispo Superior Court to determine rights to the basin water. San Luis Obispo County, the LOCSD and two other water purveyors are now collaborating under a court order to determine water rights. Last week, the San Luis Obispo County Board of Supervisors extended an ordinance prohibiting new development in the Paso Robles basin that uses more water than it saves. The controversial ordinance will expire in August 2015, but some opponents of the regulation have threatened to sue and send the basin into adjudication. Courts have adjudicated a total of 22 groundwater basins in California. In 1997 the Conservation District filed a lawsuit? Was that suit tossed and the basin is intact for the benefit of the land owner?